Ancient Legends are Clues left as aids toward understanding the distant past. Earth's geo-dynamic past is not what is claimed by gradualist schools of thinking, for they dismissed the accounts of witnesses carried forward for us as legends. Systemic-disrespect for legends for over a hundred years, has created a fiction that has been made to appear as reality. In this and in many other ways they've exposed the spirit of deception which guided the emerging sciences. A portion of a sign from Vista Encandata along road to Cape Royal on North Rim, it goes on to tell the modern fiction of gradualism. 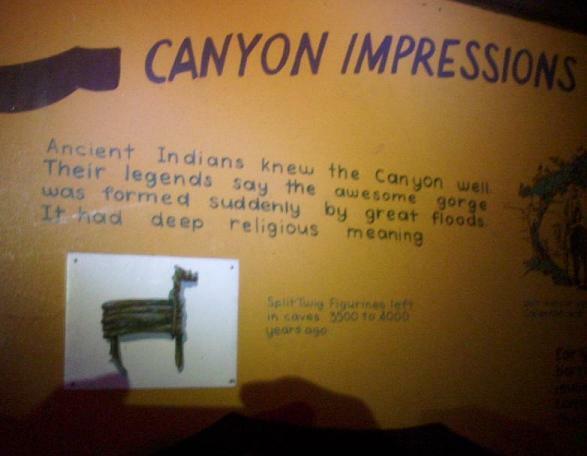 Before the canyon became what we see today its location most likely provided subteranian drainage pathways for Hopi Lake and eventually Grand Lake -which are described be Walter Brown associated with his Hydroplate theory. Those pathways would facilitated what would happen next as the lakes drained during the consequential effects of catastrophic events caused by a celestial intruder, bringing localized physical alterations which included electrical effects. It is interesting to note that a meteorite crater resides at the south edge of where Hopi Lake (also called Bidahochi lake) once rested as an inland body of trapped water. At this phase of investigation the lake seems to have predated local accounts. But 5000 year of inhabitation is claimed by some accounts so its presence may just not be recent enough to retain an active presence in legends.. Hopi lake's deposits are described in several USGS studies and identified as the Bidahochi formation. Details which are not considered in their stratification models are the catastrophic events which re-arranged this planet's surface in human historical times. They included: vertical and horizontal changes from various influences; displacement of emense volumes of water and material in solution; electro-dynamic displacement of material; and being baked under an enveloping plasma's presence. The views expressed here will be a compilation from many researchers of varied beliefs, since history is too big for any one discipline to manage and give fair treatment to all the evidence.. So i make these observation as a neutral observer. Be aware, however, that the catastrophic perspective told by every one of the world's ancient cultures will be the first voice being heard rather than it being marginalized,, as has been the practice of modern gradualist sciences. Amoung others deciphering evidence are researchers from plasma-cosmology and comparative mythology and plasma sciences as well as the solar science of the Electric Sun. Some researchers in these fields are agreeing about the need to attempt an historical reconstruction respectfull to the ancient evidence left for us as myths, legends and the carved-on-rock* record of past events. (The plasma perspective is quite complex and handled in detail by those mentioned above). My thoughts which follow may not be shared by the experts mentioned above. The presence of water, even saltwater, in these inland lakes and subteranian waterways could have facilitated an event of great ferrocity and what remains is the Grand Canyon feature, formed suddenly by great floods just as the legend states. We may be able to connect certain events directly to a single cause but the likelyhood of detached-causes is identified in an example described by Walter Brown as "the Big Crack" that is Marble Canyon, a delayed reaction to the removal of an over-burden upon the crust. Many other features around the region stand as clues to other stages in the event. The trigger may have been the effects of an incoming meteor so this is were the branches of evidence need to be followed. Some expected features along that scenario are petrified wood of a plasma-heated nature and possible submersion in mineral rich waters. This, in part, is what happened at Spirit Lake near Mt. St. Helens where trees were carried -by the blast of the mountain's explosion- into the lake where they sank root first and then were petrified in 10 years.. But the plasma source of the AZ scenario may have been the meteor's final phase , the release of its explosive forces striking the edge of Hopi Lake forming a crater in the muddy basin just like you can make with a drop of water into a shallow pan with dirt settled at the bottom. A tidal wave, severe earthquakes and volcanic eruptions are almost certain consequences,, making this event a real bad day in the lives of anyone in the area on the surface or in big rooms underground which could have collapsed during extreme earthquakes or associated with volcanic activity, also triggered by a meteoric intruder's explosion over -or contact with- the ground. The displacement of lakebed material is one of several details to be identified in this post-catastrophic examination of the area. Added to this are the relative elevation of features and places around the area, which can quickly give us a picture of what occured. Based on recent google earth viewing, a projected lake elevation of less-than or = to 6000ft at present altitude offers up an initial marker for the placement of cliff dwellings around the area and plateau islands. (Specific figures similar to these are presented by Dr. Brown in his online book, and i mention it here only with regard to his hydroplate theory and Hopi Lake). My research is about recognition of legends as historical clues from witnesses of events which we may never see repeated, all we might see is traces of what happened. On and around the plateaus should be evidence of displaced material that would be expected of lakebed locations rather than plateau tops. 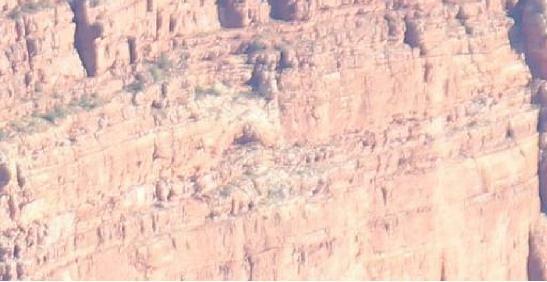 One example revealed by Dr. Brown was the presence of petrified block atop a plateau near Marble Canyon... Someone has since removed them by helicopter,,, a disgracefull act so common of capitalist intruders and those who would preserve a lie rather than allow truth to emerge from the evidence..
We should also find displaced material in adjacent valleys and here i will quickly mention two obvious clues -viewable in satelite images: to the south west of the crater, and beyond Sedona are accumulations of interest; and to the northeast is Comb Ridge a wave-wall with white capstone covering its south-faceing slope. An impact-wave could have transported water and sediments across-and-around what is now Black Mesa, agianst the Canyon de Chelly area and then into Grand Lake where it would have slowed sufficiently -as it pressed against that body of water- to leave this unique wave-like feature of its relocated components, which could also account for De-Chelly type material as part of monument valley structures. 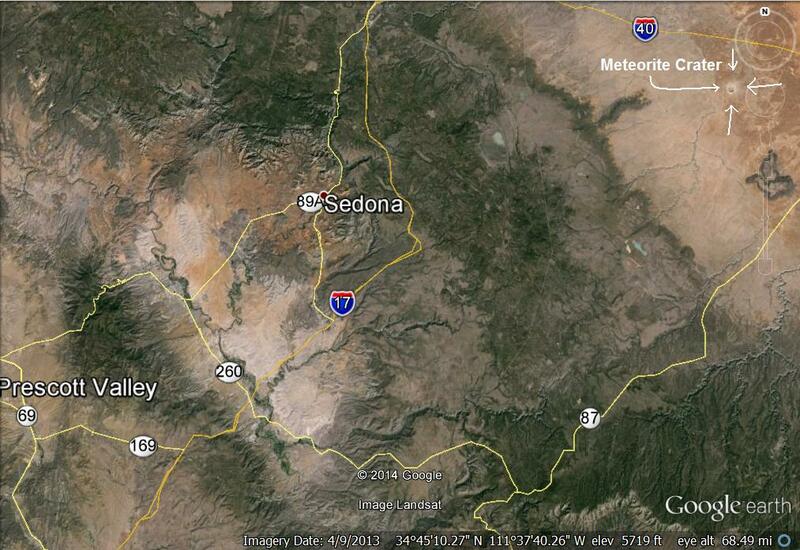 A wave-like feature at Comb Ridge to the northeast of Meteorite Crater and sediment accumulation to the southwest in Sedona's basin and beyond may reveal tidalwave displacement of material from a meteor impact. Other details of tidalwave-displaced material are recognizable in the area but they will be added to adjoining pages when assembled. We may also ask what effect upon the earths crust might have resulted as billions of gallon of water and tons of rock are relocated. Most certainly, dimensional changes and desication of water-relocated materials would produce dramatic results. Look closely at any drying mud basin for some clues. The elevation of the inland lake was most likely lower than the present surface of the region, isostatic rebound of the crust could have occured, elevating the region to its present height as water headed out to sea.. A scenario, offered by Walter Brown can also account for the lifting of the crust as it folded and tilted during sudden stoppage following lateral movement of the crust as it hydroplaned on entrapped water and gasses following rupture of the our planet's first crust, releasing subterainian water. The biblical description of a global flood has mnay comparable stories found around the world and even amoung native american cultures. So we must ask ourselves; were they taught the flood story thousands of years ago by people who they met from another part of the world,, or did they themselves come here,, as the Hopi tell us, from across the ocean -island hopping as the water roze, arriving at the west coast of the Americas. Or did the earth experience an event of global displacement of water.. Which ever it may be, we can sure see the outcome of displaced water and creatures of the sea into landlocked lakes which became their rock tombs.. The inland lakes were only temporary but it must have been a real sight to behold and enjoy, for there is evidence of many many peoples living around these bodies of water in sheltered inlets and waterways. At the time of the draining during the next catastrophe, the survivors may have been displaced and tramatized further but they did leave us some clues in some of the legends to help us understand what happened before and after this last localized event. There are other scenarios which could emerge from a thorough evaluation of all the evidence and from the catastrophic perspective..
Our ancient ancestors deserve as much thoroughness in our investigation as they exerted in placing and maintaining in stone the record of past events and through the legends associated to the traditional artistic patterns. View of Point Imperial from picnic area at Vista Encandata. While content is being organized check the root directory for preview purposes..
3D image viewing will require a box-viewer -made by Loreo, for a computer viewing of side-by-side images. For some images, or by your efforts, anaglyph glasses can be used on that type of image-pair..
See para-az.com/stereo for more info. That evidence exists, -which necessitats an historical reconstruction of conventional science's teaching, and which is in support of myths and legends of many of the worlds ancient people came from a variety of sources referenced as link above and is continued below. The following links have some detail to add,, but may have other objectives which are contrary to my faith teachings which say that "faith does not require proof".